Tender shrimp are topped with an artichoke “crust” in this simple and delicious take on the traditional pastry-topped pot pie. 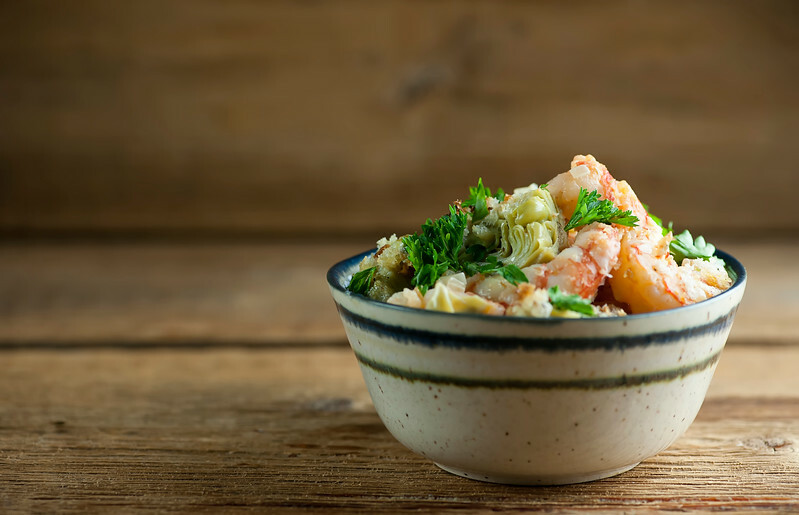 So ditch the pie crust and go for shrimp artichoke pot pie! So, this recipe for shrimp artichoke pot pie almost didn’t make it onto the blog, because try as I might, I couldn’t get a picture that I was happy with. And usually when that happens, I usually don’t post about the recipe, because for me and my little blog, it’s as much about the picture as it is the recipe. But this one…this recipe was just too dang good and easy for me to not break all my rules and post a less-than-wonderful picture, and when you take a bite of this one you will understand. Ready for a whole new take on pot pie? Let’s make it! It’s one of those under-30-minute miracles of scrumptiousness that can turn an ordinary Tuesday night into ooh-la-la. It just doesn’t take a pretty picture, and because that makes me nuts I will add a completely irrelevant picture I took out of the airplane window one time when we went down to Clemson University to visit the Southern daughter. Pretty picture, right?? I feel better now. Almost as good as you will feel after you make this quick and scrumptious supper…you’ll never feel the same way about pot pie again! Melt 2 tablespoons of the butter in a frying pan over medium heat and saute the garlic until softened. Add the shrimp and red pepper and stir for another 2-3 minutes. Scoop everything into a bowl and set aside. Add the remaining tablespoon of butter and the olive oil to the skillet. Add the shallots and saute for two minutes over medium high heat. Add the artichoke hearts and stir for 2 minutes more. Add cream, salt, pepper and tarragon and bring to a boil. Reduce heat and simmer for 5 minutes. Pour the seafood mixture into a broiler-safe baking dish that will hold it in one layer. Spread the artichoke “crust” mixture over the top. Sprinkle with parmesan cheese and bread crumbs. Pre-heat the broiler and broil the pot pie until the cheese is melted, about 3-5 minutes, watching carefully to make sure it doesn’t get too brown. Serve at once. I always feel SO SAD when pictures of dishes I love just don’t turn out. Because I refuse to post them also and I end up feeling guilty for not sharing them and then I have to make them and try again for a good shot. It’s intense. A spring pot pie…sounds fabulous to me! It’s a dilemma….I have about 10 recipes lounging around with less than good pictures. I’m just going to have to make them again…but I have so many new ones in line! Sigh. First, let me say that IS a mouth-watering photo. Truly. I live in artichoke country, and love ’em. The tarragon seals the deal. I could definitely enjoy this dish, and I shall! Aw, thank you! That makes me feed better. I think artichokes should HAVE their own country, that’s how much I adore them! I made this dish for my gourmet club on Monday nights, and it was a big hit. SO delicious, and so easy! That tarragon-seafood combo is the best, and the toasty parmesan/artichoke topping was just icing on the cake. Thanks for the great recipe! OMG, that looks gorgeous. You eat with your eyes, remember, and I can see how delicious it would be. I just bought some grilled baby artichokes packed in olive oil, and I may use them for this. Yum! Oooh, those sound amazing, for this recipe or just about anything else! I want to experience this dish. Looks great but…. For the life of me it looks like there are carrots in the dish and I don’t see them in the recipe. That makes me wonder if there should be a package of mixed vegetables in there somewhere. Can you help me be sure about the carrots? Nope, no carrots! I think you are just seeing the nice pink~orange cooked shrimp! 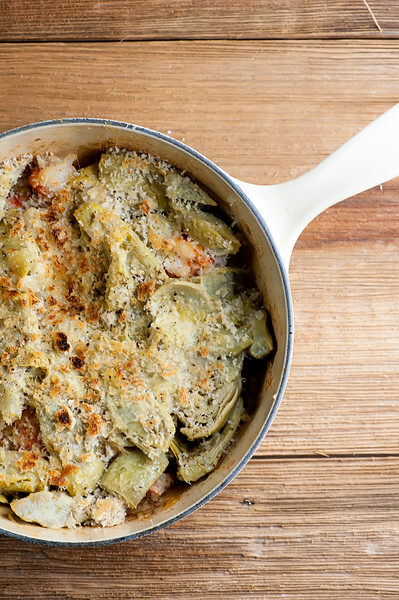 Many of your recipes call for frozen artichoke hearts. I can never find them near me. What would be a good substitute? Thank you. Hi Ellie! If you can find artichokes in a can (usually in with all the other canned veggies) those will work too. I would just rinse them really well with water to clean out some of that “canned” taste. Hope this helps! Thanks Kate! This helps tremendously!